I Love playing Mitch Millers Christmas Song, Must Be Santa. I even play it now, that he has pasted away in his 90's. GOD Bless Mitch Miller and all who entertained us back. We are al the wiser for knowing and loving such Great People. 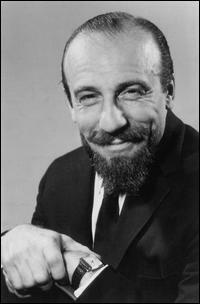 Mitch Miller was one of those guys that artists like to caricature. He had a good show; I wonder if it started out on radio. One doesn't imagine a singalong to be rich in video content. A few years ago I heard a radio interview of Rosemary Clooney conducted by Marian McPartland on her "Piano Jazz" radio program. Rosy told Marian how she did not want to record "Come On-a My House" but Mitch Miller insisted she do it, under threat of being fired. He then ordered the pressing of some huge number of records. He seems to have had an instinct for what sells and he had the power to singlehandedly order all those records. Rosemary Clooney had already had a degree of success, as a studio singer at WLW and then with Tony Pastor's orchestra. She hated the song and considered herself a sophisticated singer. When the record was released, she was touring in Europe and had no idea of its enormous success until she returned to the USA and heard it playing in the streets from record shops. Mitch Miller was instrumental in making Rosemary Clooney very popular on records and in a few successful movies. I wonder how many other careers he launched or boosted.